Dehydrating food is easy, efficient and offers a way to transform certain foods into tasty treats. You can easily buy dehydrated foods, but it is more cost effective to dehydrate your own food. That is where the Magic Mill Pro XL Electric Food Dehydrator comes in and it is a great addition to your kitchen. So why would you want to dehydrate food? For one, dehydrated food tends to be intense in flavor and you can make healthy snacks by dehydrating fruits like bananas. Dehydrating food also ensures that you keep a stock of your favorite fruits and vegetables to enjoy them when they are out of season. Saving on space is also one of the biggest motivatiors when it comes to dehydrating food. Dehydrated food takes less space and this in turn saves you much valuable space in your refrigerator and pantry. The Magic Mill Pro XL Electric Food Dehydrator is designed to help you easily and efficiently dehydrate diverse types of foods. It also allows you to create tasty, nutritious and healthy homemade snacks. Save on space, preserve foods and create natural healthy snacks with the Magic Mill Pro XL Electric Food Dehydrator. The Magic Mill Pro XL Electric Dehydrator comes in a large countertop design. It is easily accommodated on kitchen countertops and its spaciousness allows you to dehydrate large amounts of food at a go. With 9 drying shelves, 9 mesh sheets and 5 non-stick trays; you are spoilt for choice when it comes to bulk dehydrating using this product. It is a 9-shelve dehydrator and comes with 9 additional mesh sheets and 5 non-stick trays. This means that you can dry up a large amount of food at any instance. Its large capacity makes it a great asset for anyone with a home garden or farm and needs to dehydrate large quantities of food at a go. This in turn helps to save on energy and time. It features a see-through front casing to allow you to check on the progress of the dehydrating food without having to open the cover. Opening the cover will interrupt the process and end up prolonging dehydration time particularly if you open the cover several times. The see-through front cover is quite useful in this sense, and keeping it closed ensures that there is even dehydration across the shelves. The dehydrator comes with a digital thermostat enabling you to preset temperatures to suit your dehydrating needs. The thermostat is adjustable and allows you to select the right temperature for dehydrating a specific food. You can set it the night before and find aromatic flavors of dehydrated food floating in your kitchen when you wake up in the morning. A drip tray is conveniently located at the bottom to collect all residues from the dehydrated food. This makes it easy to clean up and reduces on overall mess. A timer is included to allow you to set the time for dehydrating different types of food. You can go about your chores or even leave it overnight and the dehydrator will continue running until the timer runs down. The Magic Mill electric dehydrator also features an automatic shutoff feature. Once the timer runs down, the dehydrator is automatically turned off. An instructions manual, 9 drying shelves, 9 mesh steels, 5 non-stick trays and a set of oven mitts are included in the package. With 9 shelves accommodating food inside the dehydrator, one of the concerns would be getting even heat distribution across the shelves. 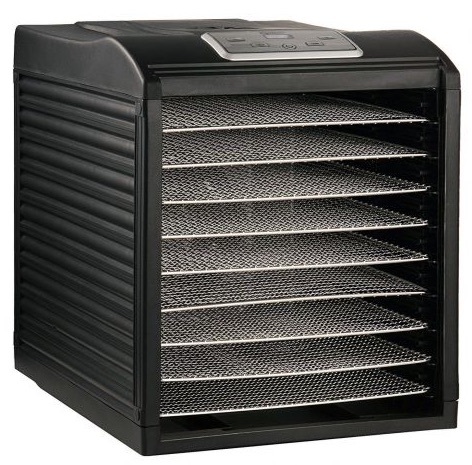 The Magic Mill Dehydrator is designed to take care of this with a rear-mounted 600W drying fan. The dehydrator also uses an advanced air circulation flow technology promoting even drying without the need for shelf rotation or causing overheating. The digital thermostat is the highlight of this dehydrator and it is adjustable. The thermostat can be adjusted between 95 to 158 °F making it highly versatile when it comes to different levels of dehydration. The timer easens the process of setting the dehydrator to function optimally with different types of foods. The auto-shut off feature works in hand with the timer. Once the timer runs down, the dehydrator is automatically turned off to avoid over drying of food. This feature is quite useful, because it frees up your time allowing you to go about your daily chores without having to check on the dehydrator severally. The unit features a backlit-LED display making it easy to adjust the settings in low light situations. The display features temperature control and timer adjustment buttons. It also features the on/off button. It isn’t called Magic Mill Pro XL Electric Food Dehydrator for no reason; this dehydrator comes in a large enough size to enable large amounts of dehydration at a go. The dehydrator comes in a sleek modern black appearance and measures 12 (W) by 17 (L) by 19 (H) inches. It will take up quite some space on your countertop, but it fits right in your kitchen and is a great investment for large-scale dehydration. The drying racks measure 13 (W) by 12 (L) inches. They are adjustable to easily slide in and out of the unit. The spaciousness of the dehydrator makes it possible to dehydrate large amounts of food at a single instance. This is very useful for people with home gardens or farms who want to preserve their produce. Ultimately it saves on time and energy use. There is a 6-shelf version offered, which is in every bit as spacious as this one. The stainless steel shelves make this dehydrator a step above others that come with plastic shelves at a similar price point. The stainless steel shelves are high quality and their size is equally large enough to accommodate a lot of food. 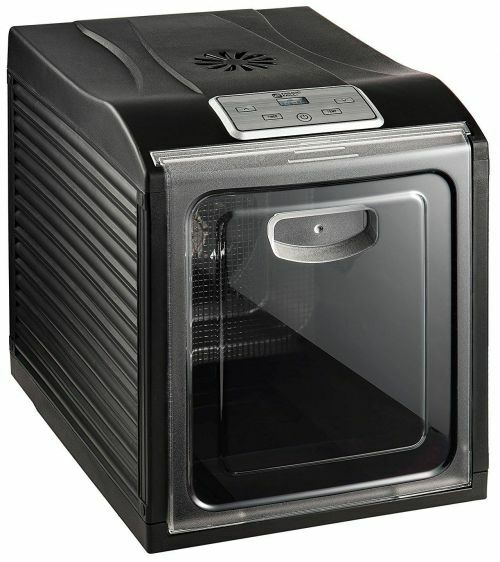 Unlike most dehydrators that come with bottom or top positioned fans, this one has a rear-mounted 600W fan. This enhances even heat distribution when drying food despite having several shelves of food in it at a go. You can dehydrate diverse foods in it including meat products, herbs, fruits and vegetables. The added plus is being able to come up with delicious and healthy treats using it. The dehydrator works quietly and doesn’t produce much noise. It is quieter than a microwave or dryer, which means that you can leave it running overnight without worrying about noise disruptions. The see-through front casing is a great asset, because it enables you to check on the progress of your dehydrating/cooking food without losing heat by opening the dehydrator. One of the things that people who start dehydrating food appreciate is saving on space. Dehydrated food takes up less space in your refrigerator and pantry freeing up much needed space. For instance, 20 lbs of tomatoes when dehydrated can easily fit in two large mason jars. The resulting dehydrated food looks professional giving allowing you to impress friends and family. Dehydrating food also prolongs their shelf life, compared to if they had been left in their natural state. Not to say that dehydrated food doesn’t go bad, but you will be able to store them longer for future use by dehydrating them. To protect your hands when removing the hot trays from the unit, oven mitts are included. For easy clean up, a tray is located at the very bottom to collect residue from the drying process. This tray can also be used to make fruit rollups. Being able to dehydrate food yourself allows you to control what goes into it. Unlike most store bought dehydrated snacks which have additives; you can create additive-free snacks out of natural fruits keeping them nutritious and healthy. The long-term benefit of getting this dehydrator is saving on money spent buying store bought dehydrated foods and snacks. Store bought dehydrated foods always have a markup making them quite costly, but being able to dehydrate your own foods ensures that you save on cost. You could also buy fruits and vegetables in bulk when they are in season at great discounts. Dehydrate them and you have a stock for when they go out of season. The plastic ‘new’ smell can linger quite a bit when initially using it. However, this is a problem that can be sorted by properly cleaning it. Follow the instructions manual on how to properly clean the unit and try cleaning it using some baking soda to get rid of the plastic smell. Food such as meat often sticks to the racks which features rough surfaces. It is also quite hard to remove the food that gets stuck on the racks. However, the non-stick trays are a good alternative to use when drying meats to avoid this problem. While 6 and 9 tray options might be considered quite generous, some consumers feel like they would have liked if it came with an expandable ability. Users who want to dry food in bulk might feel like the 9 shelves are not enough to get the job done quickly and efficiently. The timer alarm can be quite loud, particularly when the timer runs down at night. The inability to turn it off or select a silence mode somewhat detracts from its effectiveness. A few consumers have complained about experiencing temperature control issues, where the temperature wouldn't go up to the 158 maximum. This could be a combination of human error or due to faulty units. Also the inability to program specific temperatures is a challenge. The dehydrator comes with pre-set temperatures, which users have to select based on the food that they are dehydrating. Given that most foods take 5+ hours to dehydrate using the dehydrator, it ends up consuming quite a lot of energy. This is particularly the case if you use the dehydrator heavily. There are ways about this, but it would have been helpful if it came built to be energy-efficient. It is quite spacious and what this means is that you will have to free up quite a bit of counter space to accommodate it. This is especially an issue if you don’t have a lot of counter space to begin with. The dehydrator can also cook some foods, but a c﻿ookbo﻿﻿ok isn’t included and this would have been helpful. However, you can find recipes to try out with the dehydrator online. This isn’t entirely a bad thing about the Magic Mill Pro XL Dehydrator, but users who have had great experiences using the dehydrator tend to get addicted to dehydrating food. Again there is nothing wrong with this, but it can contribute to high costs of electricity bills. Q: Does It Come with Temperature Presets and are they adjustable? Yes, the unit comes with adjustable temperature presets. The temperature range is 95 to 158 °F. Q: Does It Come with Leather Sheets? No, it comes with 9 stainless steel shelves, 9 mesh trays and 5 non-stick trays. However, the tray at the very bottom that collects residue can be re-purposed and used to make fruit rollups. Q: Why Get the Magic Mill Pro and Not the Magic Mill? The pro edition is an upgrade of the Magic Mill dehydrator. It features a rear-mounted fan for even heat distribution and stainless steel drying shelves. The pro also features an auto shutoff feature and it is electric. Q: What Is the Timer Limit? The timer goes all the way up to 19 and a half hours. However, it is recommended to rest the dehydrator for 2 hours after using it continuously for 20 hours. Q: How Does It Perform with Drying Chillies? It dries chillies pretty well. However, place the dehydrator outside or in a well ventilated room when drying chillies. Also, don’t put in other types of food unless you want them to get a little hot. Q: Is the Plus a 2 or 3 Prong Plug? The plug is a 2-prong plug. Q: How Do You Clean the Steel Trays? Use a damp cloth and gentle detergent to clean them up.It isn’t recommended to clean them in the dishwasher. Q: Does It Consume a Lot of Energy? It does consume quite a bit of energy, but your electricity bill won’t shoot up drastically. Q: How Noisy Is It? It is super quiet and you’ll barely hear the fan. Yes, it comes with a 1 year limited warranty. Q: are Replacement Stainless Steel Shelves available for Sell? Yes, you can buy replacement stainless steel trays for the Magic Mill Pro XL Electric Food dehydrator. Q: What Food Items Can You Dry or Make Using the Dehydrator? You can make/dehydrate nuts, rising doughs, yoghurt, poultry, muffins, vegetables, fruits, trail mix, jerky, desserts, pet treats, potpourri, crackers, herbs, granola and meat. You can also make dried flowers using it. Q: Can I Dehydrate Raw Vegetables and Fruits? 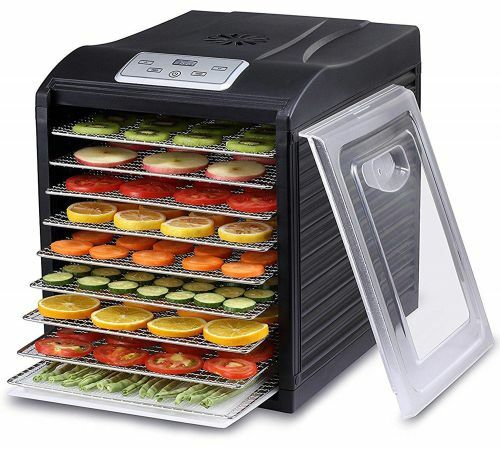 Yes, the dehydrator will dehydrate fruits and vegetables regardless of softness or ripeness. However, for best results use quality fruits and vegetables. Q: What Tips Can Help Me Dehydrate Food Better? It is important to check online for tips on how to dehydrate or cook specific foods using the Magic Mill Pro dehydrator. For instance, there are vegetables that you might have to blanch first before dehydrating. Try to dehydrate a single family of food at a go. This is simply because they’ll take roughly the same amount of time and use the same temperature for dehydration. Cut up fruits and vegetables that you want to dehydrate in similar thickness for effective dehydration. Do not place food items overlapping in the trays to avoid blocking airflow. However, you can stack up greens because of their loose nature they dry easily. Turn overripe fruits into purees. Peaches, berries and plums are some of the best fruits to make purees out of using the dehydrator. You can use the drip-tray for this or cover up the stainless steel trays with cello wrap and use it for purees. Dry onions and peppers in well ventilated rooms or keep the dehydrator outside during this time. If you have ever cooked with peppers you should know that it easily becomes airborne and becomes an irritant to the eyes. Store dehydrated foods well so that they last. Store them in heavy duty zip-lock bags before freezing. You can also store them in airtight metal containers or sterile glass jars. Last but not least, store different family of foods separately. For instance, don’t store dried strawberries with dried broccoli to avoid them picking flavors from each other. The Magic Mill Pro XL Electric Food Dehydrator is what you need to conveniently, easily and efficiently dehydrate food at home. It is ideal for anyone with a home garden, small farm or large family as well as anyone who wants to make delicious healthy treats. The dehydrator is pretty straightforward and easy to use. Plug it in and turn it on to start dehydrating your food. It comes with 9 large stainless steel shelves, 9 plastic mesh trays and 5 non-stick trays to accommodate large quantities of food. There is a 6-tray variation that costs slightly less. The digital thermostat makes it easy to preset dehydrating temperatures for different types of food. A timer is included and it runs up to 19 and a half hours. When initially using the dehydrator uses might get a plastic smell. You can take care of this easily by properly cleaning the unit. Foods such as meats tend to stick on the stainless steel trays because of its rough texture. It can be quite hard to clean up the stainless steel trays when food sticks to them. In summary, the Magic Mill Pro XL Electric Food Dehydrator does come with its fair share of merits and demerits. However, every user’s experience with it is different and based on the scores of raving reviews it comes highly recommended as a great investment.